Coming into their final game of the regular season, the Washington Redskins had a chance to back their way into the playoffs. Had the Chicago Bears and Minnesota Vikings both lost, the burgundy and gold would have been a lock for the postseason regardless of the outcome of their rivalry game with the Dallas Cowboys. So naturally, both the Bears and VIkings won their games, and the Redskins had just one option left if they wanted to continue their magical run — beat Dallas. Faced with a “win and you’re in” situation, the Redskins looked every bit like a powerhouse — punishing the Cowboys 28-18 with a heavy dose of the NFL’s best ground game and leaving no doubt that they belong in the playoffs, thanks to a seven-game winning streak. Each of the last two seasons, the Redskins were in last place in the NFC East. That’s because head coach Mike Shanahan and company went just 11-21. Now though, the Redskins are the division’s lone postseason representative. They beat their biggest rival on a national stage to improve to 5-1 against the NFC East and to go 10-6 on the year. And best of all, because Washington was able to go from “worst to first” for the first time in franchise history, the Redskins will finally get another chance to play football in January while the Cowboys, Giants and Eagles are forced to buy a ticket if they want to get anywhere near the playoffs. Coming into the game, had someone told you that Redskins quarterback Robert Griffin III would complete just nine of 18 passes for 100 yards with no passing touchdowns, chances are you’d think Washington had little to no chance to beat Dallas. 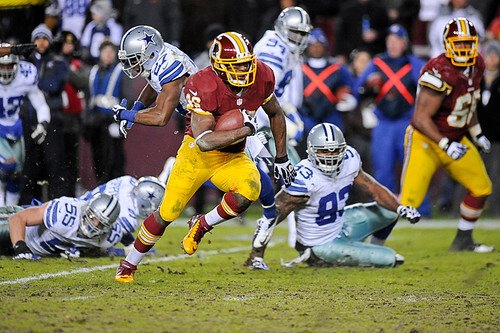 Thankfully though, rookie running back Alfred Morris picked the perfect time to have the biggest game of his young career — rushing 33 times for 200 yards with three touchdowns, all career highs. With his monster outing on Sunday, Morris finished the season with 1,613 yards, breaking Clinton Portis’ team record for rushing yards in a season (which was 1,516 in ’05). On a national stage with the entire football-loving world tuned in, Morris had the kind of statement guy most players can only dream of. Of course, because Morris is so damned lovable, he refused to let this breakout game go to his head — even for a moment. Regardless of how much he tries to downplay it, Morris became just the fourth rookie in NFL history to rush for 1,600 yards, joining Eric Dickerson (1,808 in ’83), George Rogers (1,674 in ’81) and Ottis Anderson (1,605 in ’79). While Morris was doing the heavy lifting on offense, he wasn’t the only Redskins player to make a play when his team needed him most. Outside linebacker Rob Jackson, the unheralded seventh-round pick from the 2008 NFL Draft, once again filled in admirably for the injured Brian Orakpo — this time by intercepting Cowboys quarterback Tony Romo in the final minutes of the game to effectively kill any chance Dallas had of coming back. Washington also got interceptions from rookie cornerback Richard Crawford and veteran cornerback Josh Wilson, as the Redskins picked off Romo three times on the day. For what it’s worth, Romo had thrown just three interceptions in his previous eight games combined. The more I think about it, the more I can help but believe Hall of Fame head coach Joe Gibbs would have been proud of this one. Not only did the Redskins defeat their arch rival, but they did so with a gameplan that could have been right out of Washington’s glory days — running the ball and playing aggressive defense. For all the talk about the pistol or gimmicky college offenses, the Redskins were more than content to go back to basics in Week 17. The repeated handed the ball off to their workhorse running back and dared the opposition to stop them. When Dallas couldn’t, they ran the ball some more. On defense, they dialed up the blitz way more often than usual and it resulted in three turnovers. All in all, it was a fitting gameplan for such a storied rivalry. As crazy as it is, the Washington Redskins — who limped into the bye week with a pitiful 3-6 record — will now host the Seattle Seahawks in the opening round of the playoffs. Sure, the Seahawks are playing as well as anyone these days and they’re also the same team that ended Washington’s last two playoff runs, but this time around they’re the team that must travel across the country and play in a hostile environment. The Seahawks are fairly unstoppable at home, as evident by their 8-0 record there this season, but that’s not going to help them next Sunday. And considering how long ‘Skins fans have waited to have another playoff game at FedEx Field, I think it’s safe to say there will definitely be a home-field advantage for the burgundy and gold as they continue to try and keep this storybook season going.